There’s no question that the Mass Effect series has easily grasped the attention of many modern gamers. Going all the way back to the original Mass Effect, one can clearly see a stream of progression from Bioware that now has the opportunity to culminate in fantastic fashion. Make no mistake about it, Mass Effect 3 delivers in abundance, providing a gripping tale that tackles plenty of emotional issues while at the same time sticking the series’ classic roots and expanding upon them. Mass Effect 3 is a fitting end to a fantastic series that should be experienced by anyone with a fascination for gaming. Mass Effect 3 continues the tale of Commander Shepard, who now has to deal with the deadly Reaper invasion. Those who played the previous installments will already have a good idea about the Reapers so without revealing too much information, these biomechanical monsters purge galaxies every 50,000 years and your goal is of course, to stop them. The only way to do this is to traverse previously explored and new land from the original games and attempt to unite all the nations in the galaxy into one giant army. Constant quarrel and bitter hatred between certain worlds and factions makes this task easier said than done for Shepard, but the whole notion of re-visiting lost areas and meeting old friends is one that Mass Effect 3 takes very seriously and uses these emotional ties to create a very powerful story line. Of course the beauty of the Mass Effect series is you have the ability to transfer over your character relationships and decisions over from previous games. Unfortunately Mass Effect 1 was an Xbox 360 and Windows game only, but regardless everyone who played the previous two on their respective gaming machine can transfer over their save file, which incorporates all the decisions you made and this consequentially has a massive impact upon how your story pans out in Mass Effect 3. This is a truly unique and thrilling way to create a game and while neutrals can simply pick up and play Mass Effect 3, those with emotional investments will be the ones really getting the most out of the experience. These emotional investments in particular are what Bioware are so good at tapping into. While Mass Effect 1 concentrated on exploration and introducing you to the universe, Mass Effect 2 furthered those bonds and relationships with the characters you met, solidifying partnerships and indeed, friendships. Mass Effect 3 however, boldly and on many occasions, forces you out of your comfort zone and manipulates these bonds you have made in an attempt to test your judgment and ability to make a decision for ‘the greater good’. These moral dilemmas are one of the many things that makes Mass Effect 3 an absolutely fantastic game. For those of you who have never played a Mass Effect game, but want to skip straight to Mass Effect 3, while not recommended, it’s still doable. The game begins by offering you a character creation option where you formulate your own Commander Shepard. Mass Effect 3 has a robust customization system for characters, weapons and armour, all of which can be tinkered in fascinating ways to change playstyle. For example, do you want to be a simple gun-wielding grunt, or does the idea of using augmented powers to string enemies in the air and then fill them with lead sound more appealing? 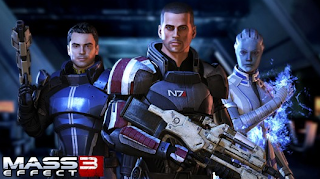 Mass Effect 3 has a variety of classes to choose from, each of which does play differently and with the help of your squad to round your abilities off, you’ll have a well-balanced team of galactic soldiers in no time. While Mass Effect 1 lacked substantially in the gunplay department, Mass Effect 2 took a few giant leaps forward for the franchise. As a result, Mass Effect 3 has been tweaked but only very slightly. Running from cover to cover and gunning over walls is still the essence of combat here and boy does it feel awesome. It really says something about the quality of a game when a RPG’s gameplay can in many ways be comparable to the gameplay of Gears of War for example. Mass Effect 3 boasts impressive AI across the board both on your team and the enemy, with the latter working as a unit to hold their positions or attempt to flank your team, whatever the scenario it seems to work well. Mass Effect 3 continues to expand upon its riches by adding for the very first time, a multiplayer mode. It is refreshing to see a game that is so obviously single-player oriented, still putting together a wholly satisfying multiplayer experience. Reminiscent of Gears of War’s Horde mode as teams of players tackle waves of enemies as you fight for survival. The multiplayer and single player are actually interconnected should you decide to explore this avenue, but fans of the series can absolutely avoid this section of the game if they so want with absolutely no consequences resulting. This is an example of a multiplayer being a clear addition and supplementing the campaign mode – with plenty of upgrades to unlock and an engaging level up system in place, you could find yourself surprisingly captivated by Mass Effect 3’s multiplayer offering. From a technical perspective Mass Effect 3 is a shining exemplar. It is visually stunning and these beautiful graphics go hand-in-hand with a terrific sound track and some exceptional voice acting. Again, to emphasize that when a game plucks at your heartstrings, it is essential for the dialogue to be believable, which is absolutely the case here. Naturally the PC version stands head and shoulders above the console counterparts, but overall the game performs well on home consoles, a few long loading times aside. Overall it’s really difficult to fault Mass Effect 3 in any way, it’s almost perfect. Unfortunately it’s undeniable that to get the most out of this experience, you really need to have played the previous games but if you’re a Mass Effect fan then get ready for a terrific ending to one of the best modern trilogies to date – this is role play and third-person action at its absolute finest. Mass Effect 3 excels at everything it does from the outset. Terrific third person shooting compliments this deep and rich role-play adventure. With plenty to do and lots of choices to make, there is rarely a dull moment here. No game comes to mind that really brings about entertainment in such a consistent manner. Mass Effect 3 is a beautiful game across the board. Fantastic visuals and audio make this an immersive and engaging experience. The story is told in a fascinating way and drives you forward with eagerness to find out how everything unravels and concludes. The RPG elements are also smooth and streamlined, allowing you to enjoy Mass Effect 3’s robust customization system. The PC version is by far the more technically impressive however. There is simply no way to get the most out of Mass Effect 3 in one play through. With a whole bunch of ways to tackle the game, you will be playing through multiple times to really experience all Mass Effect 3 has to offer. The addition of multiplayer is also welcome and surprisingly engaging. This too has a robust customization and level up system giving you another way to enjoy the Mass Effect universe. When a game has this much hype surrounding it, it’s usually very easy to nit pick and play the game down somewhat. This simply isn’t the case with Mass Effect 3. The third and final instalment of this epic trilogy brings its absolute A-game, with a beautifully woven story that providing you played the previous games, intertwines all of your decisions to make for one of the most dramatic endings to a video game series ever envisioned and created. If the mesmarising story somehow manages not to hook you, then the brilliant gameplay, terrific voice acting and plethora of moral decisions and choices surely will. Mass Effect 3 is a champion role-play game and it’s almost a sad day with this trilogy finally coming to a close. Editor’s note: There’s been a lot of controversy surrounding Mass Effect 3’s ending including a full on petition to get a new ending put into place. I personally found Mass Effect 3’s conclusion as a whole, satisfying and can’t really justify the amount of fuss that’s been brewed up. Furthermore, it’s completely up to Bioware how they choose to end the series and not down to the gamer. Saying that, Bioware has confirmed a free downloadable content pack that’s set to give gamers an alternate ending that should appease those not best pleased with the final chapter of the game, so keep your socks on!